Its been an interesting year to say the least! 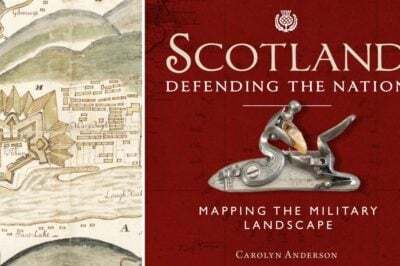 Here is a handpicked selection of seven of the most intriguing maps published online and in print in 2016. This year’s publication of the third volume of the celebrated Atlas of Design series helped to elevate the cartographic standards in 2016. 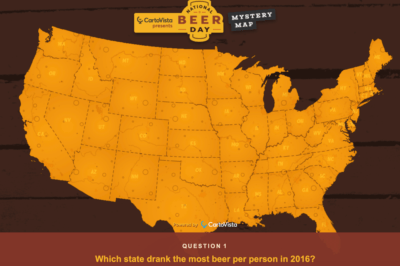 Selected for their relevance, cartographic design, or uniqueness, these maps are sure to give pause for thought. This social network map from the Electome project at the MIT Media Lab illustrates the nature of the partisan electoral divide in the United States. Followers of both candidates exist at opposite ends of the ‘Twitterverse’ with little crossover in the middle. 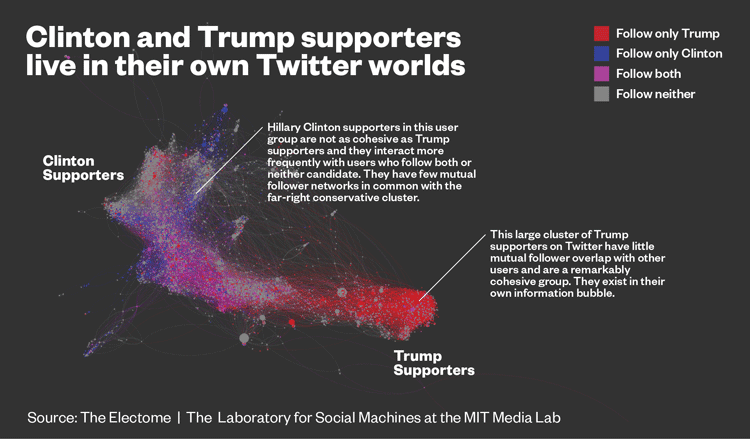 Trump supporters are a more cohesive group with a tight interconnected network, while Clinton supporters are generally a part of broader networks including bi-partisan followers and people who don’t follow either candidate. Broadly, this illustrates the growing trend of political Balkanisation of the internet, with groups of people with similar affiliations tending to cluster together and disconnecting from those with differing political opinions. This results in widely swinging discourse, and a perception that people of different political persuasions live in different universes. In some ways this is true, as the internet becomes a window to reality and people increasingly inhabit self-reinforcing discourse ‘bubbles’. In the physical world, the 2016 Arctic sea ice minimum extent tied for second place with 2007. The all time record minimum remained with 2012. This year broke the record for minimum sea ice volume however, with a November minimum 400 km3 lower then the 2012 record. This was nearly 50% lower then the 1979-2015 mean value, reflecting an ongoing loss of thick multi-year sea ice due to increasing heat content in the oceans and atmosphere. This year extent loss was mitigated due to a series of Arctic storms that spread ice out over greater areas, but the trade-off for this is thinner ice. In conjunction with a series of record temperatures up to 20C above normal in the Arctic this thin ice has contributed to the slow refreezing that is keeping Arctic ice in record low territory even after the 24 hour Arctic night has fallen. This may lead to more record lows next year, as melting feedbacks become reinforced. 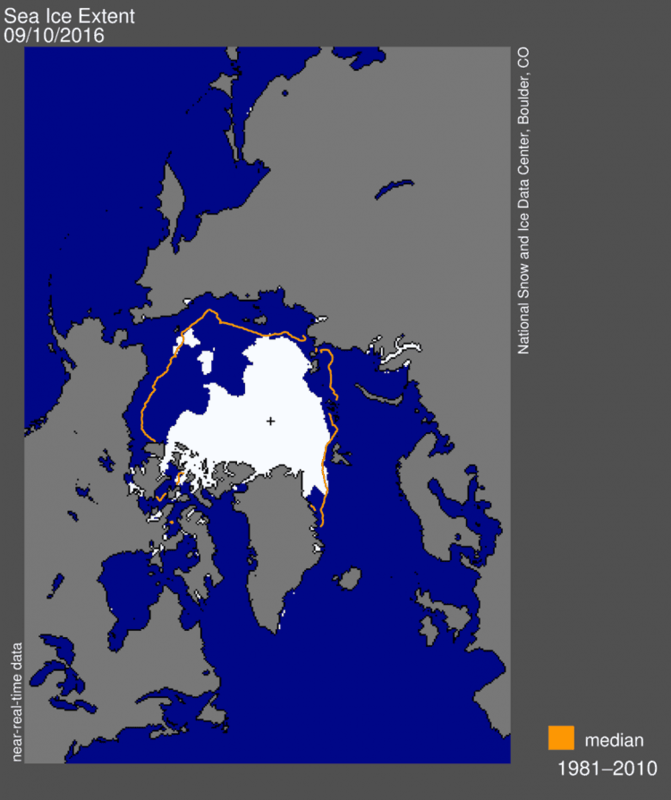 Arctic sea ice extent for September 10, 2016 was 4.14 million square kilometers (1.60 million square miles). The orange line shows the 1981 to 2010 median extent for that day. Map: National Snow and Ice Data Center, Boulder, CO. 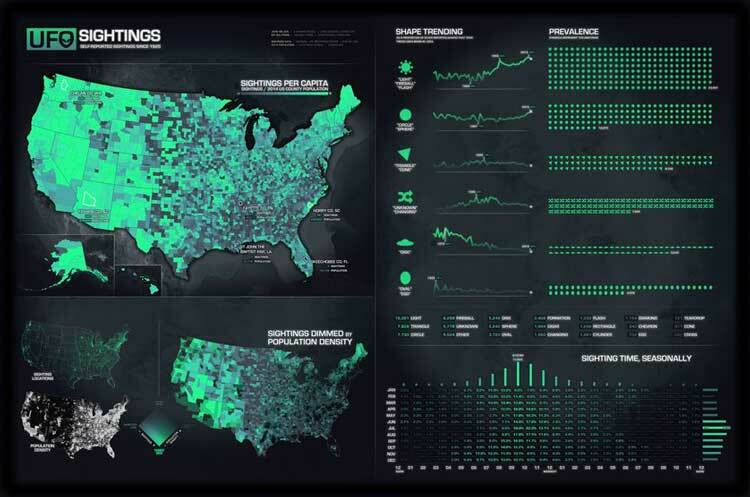 Into more fantastic territory, this map of UFO sightings in the USA by John Nelson illustrates the spatial, temporal, and shape variability of this phenomena since 1925. Extra-terrestrial visitors, mass hallucination, swamp gas, or military conspiracy? The truth is unknown, but one way or another tens of thousands of Americans believe they have seen something unknown in the sky. With a high proportion of sightings per capita in the Western states, some correlation with military test aircraft may be possible. Given the unknown capabilities and characteristics of secret developmental aircraft, they could quite literally be termed “Unknown Flying Objects” to the lay observer on the ground. Whatever the truth is, this phenomena is a curious element of 21st century society, with many reflections in popular culture and fears of invasion by ‘outsiders’. 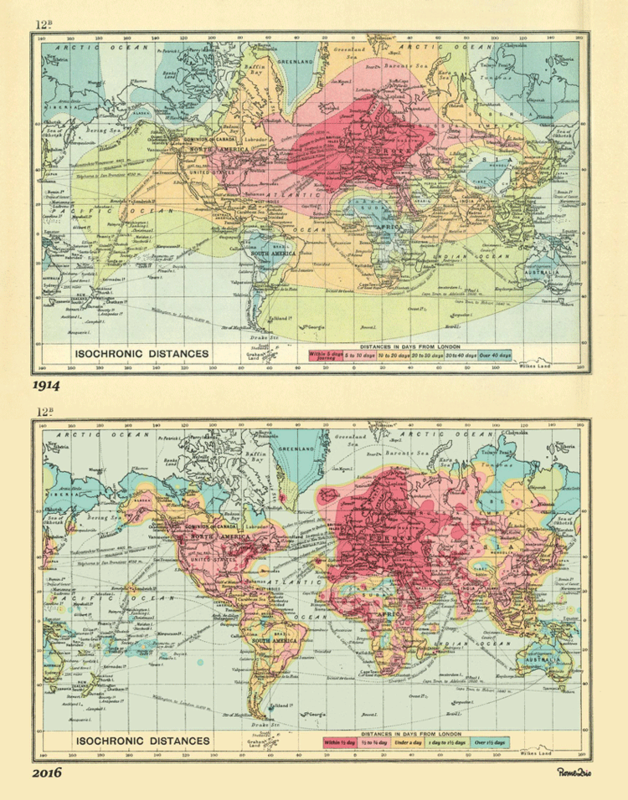 This fascinating map is an expansion of John G. Bartholomew’s 1914 isochronic map of the world. Isochronic refers to a map that visualises the time taken to reach an area from a certain point. In this case it visualises the time a traveller could expect to spend en route from London to anywhere in the world. In 1914 the primary mode of travel was by boat, or train in developed countries. This is reflected in the times taken to reach far-flung corners of the world, of over forty days in the most remote instances. In 2016 the incredible transformation of global travel by the advent of flight and the airliner is plain to see. Most of the world can be reached within one to one and a half days at most, with only the most remote corners being out of reach in this time. 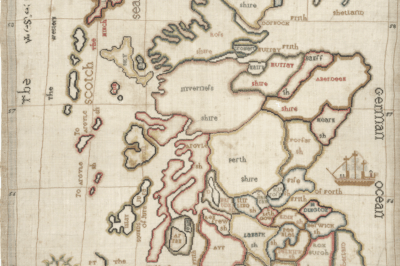 Top map: John G. Bartholomew’s 1914 Isochronic Map. Bottom map: Rome2rio’s 2016 Isochronic Map. This stark map from Levi Westerfield illustrates the human cost of conflict around the Mediterranean sea, as those fleeing are forced to take desperate and unsafe means to escape. Each red dot illustrates a life lost. 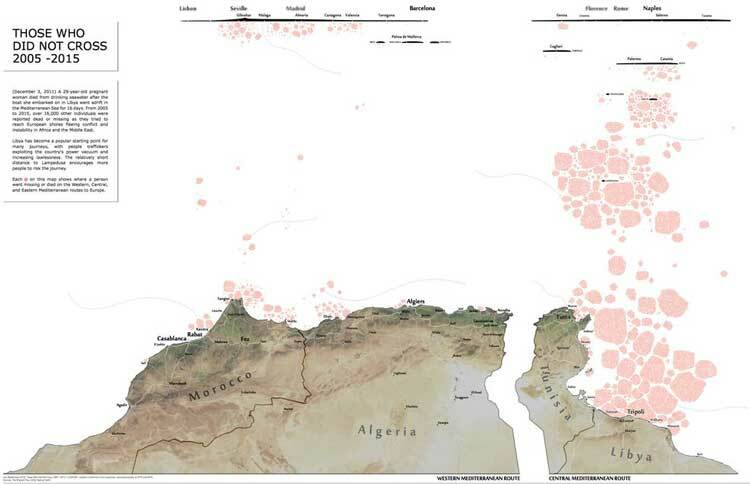 Large clusters indicate where boats have gone down with large numbers of passengers. Some dots have a curving line of text arcing away, telling the story of that individual. The spareness of these reminds us of all the stories untold here, and provides a sense of the scale of this tragedy. “Those Who Did Not Cross” by Levi Westervelt, Atlas of Design, Vol. 3. This incredible ecosystem map illustrates the range of nine main Elk herds in Yellowstone National Park, USA. 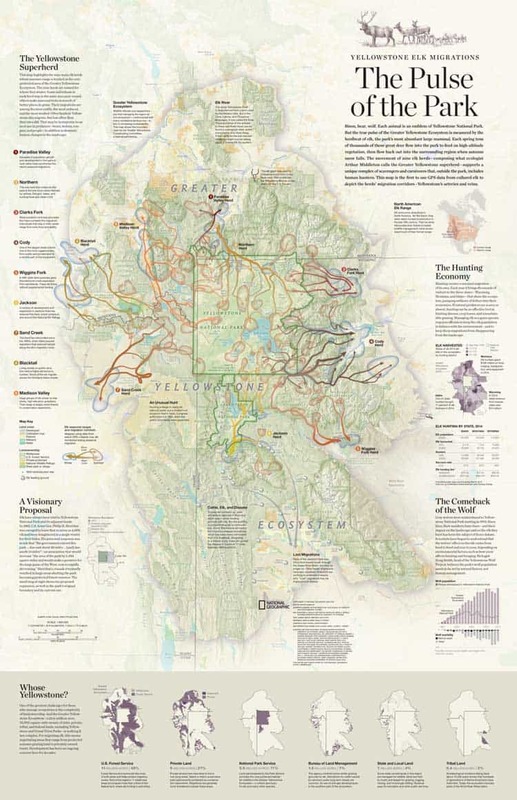 Along with detailed illustrations of seasonal migration, the map includes insets detailing history of the park, ecologies of other animals, hunting economies, and the management of the park. It is said that the map is the territory, and this kind of ecological map-making may mark a new frontier in communicating the ecological elements of the Earth. To visualise and understand these elements and how they interact is to give them weight and validation. “The Pulse of the Park” by Martin Gamache, Arthur Middleton, Lawson Parker, Shelley Sperry, Lauren Tierney, Atlas of Design, Vol. 3. Inspired by Austrian artist Heinrich Berann’s beautiful images of mountain ranges, geographer Brooke Marston set out to create a similar image using accurate geospatial data. That means that unlike Heinrich’s works, this map portrays the positions of peaks and valleys with great accuracy, and represents the true scale of the range. Marston writes “The overall effect is to portray the scale and grandeur of this dramatic wilderness from the perspective of a soaring bald eagle “. Which certainly seems an apt description of the effect created here. This style of map could be used for a range of utilities, particularly if the digital version were to be used to enable zooming, panning, and rotation of the viewpoint. For now though, it’s rather nice just to look at. 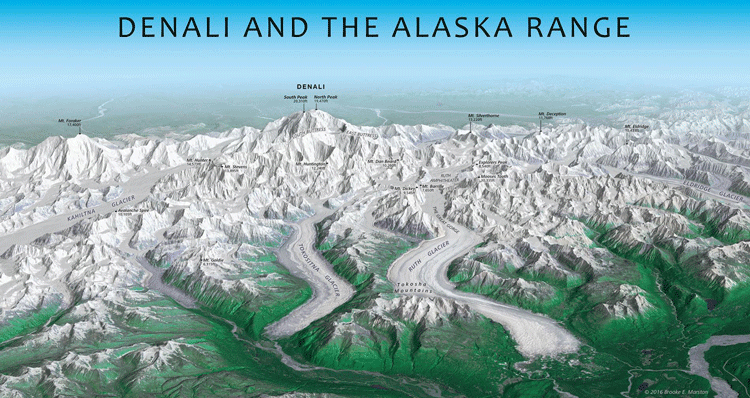 Panoramic map of Denali and the Alaska Range by Brooke Marston, Atlas of Design, Vol. 3.